Home|Floral Library|Starfish Plant – Cryptanthus spp. 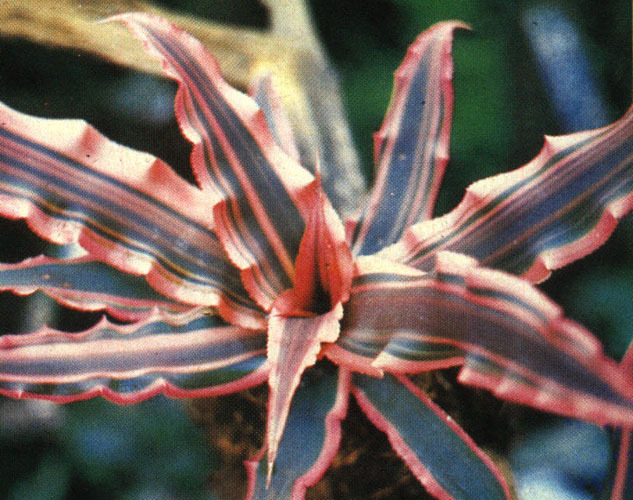 Starfish Plant – Cryptanthus spp. Most bromeliads only flower once under home/office conditions. However, if new off-shoots are produced, it is possible to induce them to flower by treating the plant with ethylene gas. To treat a plant, place one or two ready to eat apples next to the plant and then seal the plant and apples in a plastic bag. Keep the bag sealed for two or three days at room temperature. Remove the bag and apples. It may take many weeks before you will know if the treatment was successful. Finally, since this bromeliad species does not flower much too begin with, it may be even more of a challenge to induce flowering. Cryptanthus: Greek for hidden flower in reference to the flowers being nested in the foliage. The most common member of this family is the pineapple, other species are grown for fiber but most are grown for ornamental value. Most cultivars can survive under a wide range of light conditions. However, they will generally grow well in light levels bright enough to read a newspaper in comfort. Wolverton and Wolverton (1992) showed that this is one of many foliage and flowering plant species that can remove air pollutants such as formaldehyde and/or benzene often found in cigarette smoke from interior environments.